Bade, Klaus J, Brown, Allison (tr.). Migration in European History. Oxford, Blackwell, 2003. ISBN 0631189394. OCLC 52695573. Keegan, John. 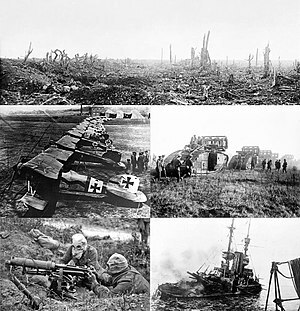 The First World War. Hutchinson, 1998. ISBN 0091801788. Taylor, Alan John Percivale. The First World War: An Illustrated History. Hamish Hamilton, 1963. OCLC 2054370. Willmott, H.P.. World War I. New York, Dorling Kindersley, 2003. ISBN 0789496275. OCLC 52541937. Зайончковский, Андрей Медардович. Мировая война 1914 – 1918 гг. М.: 1938. 1938. Последната промяна на страницата е извършена на 22 април 2019 г. в 20:43 ч.